The presence of several large and small scale companies has rendered the global automotive pinion gear market highly fragmented. 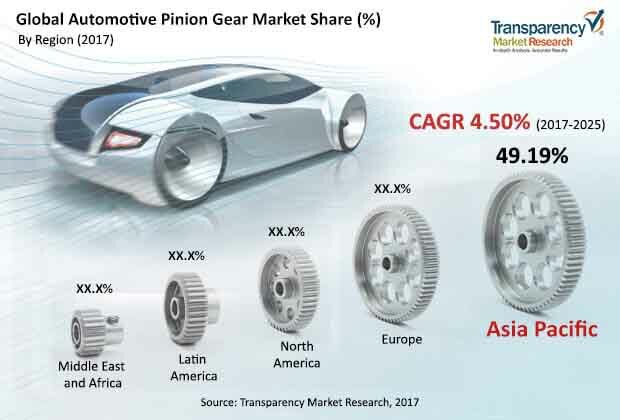 Some of the leading players operating in the market are Bharat gears, SHOWA Corporation, Renold Plc, B & R Motion Gears, Samgong Gears, Mahindra Gears, Eaton, Precipart, Gear Motions, and BMT International SA, finds Transparency Market Research (TMR) in a new study. Product innovation and investment toward technological advancements are among the trusted strategies adopted by the market players to gain a competitive edge. While these efforts on part of prominent companies are aimed at achieving growth targets, they also exercise significant influence on the overall market, aiding its expansion across the globe. According to TMR, the global automotive pinion market will reach US$13.15 bn by the end of 2025, as compared to US$8.81 bn in 2016. If these figures hold true, the global automotive pinion market will rise at a steady 4.5% CAGR between 2017 and 2025. Among the gear types, the helical pinion gears segment constituted a larger share in terms of revenue, thus emerging dominant in 2016. Holding nearly 50.73% of the global market in terms of revenue, Asia Pacific emerged as the largest market for automotive pinion gears in 2016. Its dominance is likely to remain secure in the global market through the course of the aforementioned forecast period. Rapid urbanization has pushed the demand for passenger vehicles in the region. This will in turn support growth of the automotive pinion gear market in Asia Pacific. Besides the increasing population and rapid urbanization witnessed worldwide, the global automotive pinion gear market will considerably benefit from consumers’ rising purchase power. Spurred by these factors, vehicle sales have spiked in the last few years, in turn creating an environment supporting the automotive pinion gear market’s expansion. Also the rising demand for vehicle is attributable to the changing city architecture and demographic patterns. With citizens inclining in favor of hub and spoke architecture, urbanization is likely to pick pace in the coming years, subsequently making the overall commute distance more widespread. Besides this, the concept of weekend getaways has gained much popularity in the last few years. These factors will stoke growth in the global automotive pinion market in the coming years. On the downside, weakening global investment and dwindling world trade growth have raised concerns for the global automotive pinion gear market. Slow growth rate of trade and investment may have an adversely impact automotive industry’s overall productivity. Furthermore, this could impede progress toward achieving sustainable growth in the industry, thereby posing threat to ancillary markets such as that for automotive pinion gears. Nonetheless, a surge in vehicle production is on cards especially in emerging nations. Supported by the rising disposable income of consumers and their willingness to spend on luxury cars, the emerging nations will provide ample opportunities for the market’s expansion in the coming years. Furthermore, the increasing production of vehicles with automatic transmission system will accelerate pace of gain for the global automotive pinion, market. It is important to note here that four-wheelers use more number of bevel pinion gears than their two-wheeler contemporaries. This, coupled with technological advancements, will give significant impetus to the global automotive pinion gear market in the coming years. Rapid urbanization and increasing disposable income will boost sales opportunities for automotive pinion gear market. Increasing production of vehicles with automatic transmission systems will enable market gain momentum in coming years.